Phrases I've been thinking about off and on over the past year are the phrases Moral Injury and Moral Hazard. The concepts here (as currently used) are different, and typically appear in different contexts. Moral Injury seems to be discussed a lot recently as a side-effect of military involvement. Mutually exclusive from Post-Traumatic Stress Disorder (PTSD), moral injury is viewed as a psychological wound often associated with seeing something or doing something against someone's morals. Moral Hazard on the other hand, seems to be used more in talking about major corporations or governments who make calculated choices (and risks) knowing that harm done will not impact the party taking the risk. This term seems to be used negatively to describe financial, banking, energy, and insurance industries. In addition to the difference of sectors which these words get used (military and big business) it strikes me that these words aren't discussed hand in hand more. An example of how I think these terms inter connect is portrayed really well in the film Margin Call (for which J.C. Chandler's screenplay received an Academy Award nomination last year). 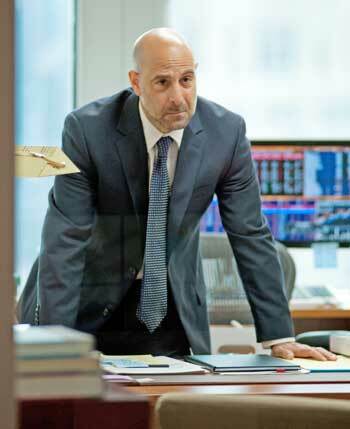 Margin Call focusing on a firm in 2008 who starts the domino fall on the economy in it's quick sell off of mortgage back securities, presents a typical (but very powerful and multi-level view) of the corporate decision making process that might lead to risk being taken in away that exemplifies Moral Hazard. In fact, it's a text book presentation. But what I think captured me was the way in which three of the central characters Eric Dale (Stanley Tucci), Peter Sullivan (Zachary Quinto), and Sam Rogers (Kevin Spacey) wrestle with the decisions that are being made. In each of these three cases, these men realize at the time the risk being made and are not happy about the decisions being made. The same statement could apply for many other characters in the film, but these three's struggle is portrayed most clearly. And since this is fiction (based on similar real events) presented in a short amount of time (approximately 32 hours), we don't get to see how these characters are impacted long term by the decisions made. Sure, we see some of the common culprits of this Moral Hazard example in terms of the golden parachutes and bonuses that allow some to prosper from devastation caused to others, but we don't see past that. And in that short-term presentation, the concept of Moral Injury isn't explored in the film to the same depth as the Moral Hazard. I think the development of these terms are still in their infancy, and we will see them used more and more in years to come, but I think that wherever there is Moral Injury we should ask if there is Moral Hazard, and where we discuss Moral Hazard we should look for Moral Injury. In this, I mean, if we are talking about soldiers coming back from war with Moral Injury, we might ask if the government, or people in authority are placing soldiers in positions (right or wrong) where they are exposed to things causing this type of harm. And if this is the case, if this a cost of war, or is there ways (other than post-event counseling) that can help avoid this type of harm? Similarly, in the realm of companies where Moral Hazard is at play, should such discussions not just talk about the "big bad corporation" but also delve into the stories of individuals who might be trapped in a place where they feel they have no choice but to commit such destructive acts (because standing up to the corporation, or even their next level of management, or the media) will result in termination or significant individual hardship. Thus, there actions to avoid such hardships put them in a place where they to experience Moral Injury knowing that their actions are outside the scope of their defined morally acceptable behavior. I think these are important concepts for us to talk about as a society, both in the board room and around the dinner table. And I can appreciate a film like Margin Call for presenting a meaningful portrayal of these ideas, with trying to be an overly politicized message film, but presenting the complex world as it is...complex. I enjoy what you guys are up too. This type of clever work and reporting! Keep up the wonderful works guys I’ve you guys to my blogroll.